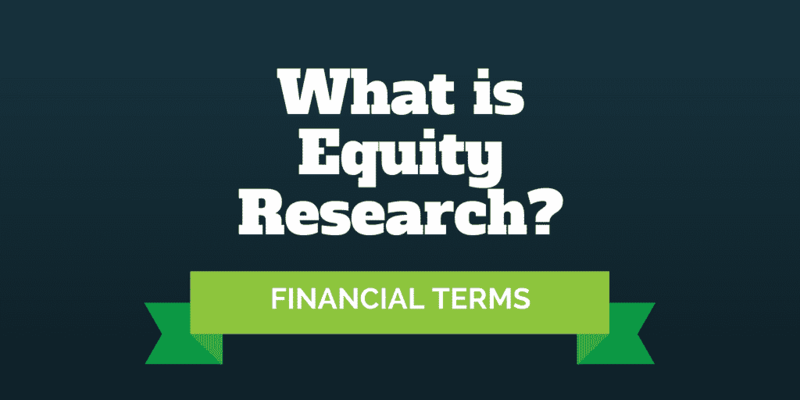 Home › Financial Terms › What Is Equity Research? In the world of finance, equity research is the link between investors and corporations. An equity research analyst usually has a specialty sector, such as technology or healthcare. Within a particular sector, the equity researcher may cover as many as 15-20 companies, meaning they analyze the financials, speak with management where permitted, and provide insights with respect to future business trends, opportunities and risks. Investment management firms employ equity research analysts to conduct detailed financial analysis in order to assess whether a company may be overvalued, fairly valued, or undervalued. Banks who sell research to investment management firms and other clients employ equity research analysts in their Equity Research divisions. This research can also be used to inform corporate development officers when considering mergers or acquisitions, as well as leveraged buyout offers. But what exactly do equity research analysts do, what do equity research reports look like, and how much do equity research analysts earn? What Type Of Equity Research Analysts Are There? How Much Do Equity Research Analysts Make? What Is The Career Trajectory Of An Equity Research Analyst? An equity research analyst usually splits time between qualitative and quantitative due diligence. Some buy-side investment management firms will emphasize qualitative research. For example, Warren Buffett, who may be the most famous of all equity research analysts, is renowned for emphasizing that investors focus on the competitive dynamics of an industry. The idea behind his investing philosophy stemmed from one of his first investments in Berkshire Hathaway, which originally began as a textile mill. He realized that even a good manager couldn’t fight against the powerful forces commoditizing the textile industry. As an investor, it is better to research investment opportunities in sectors that have sustained tailwinds. Even investment management firms that concentrate on qualitative research to assess a sector and company’s trends, opportunities, strengths, and weaknesses will conduct extensive quantitative research. Usually, this means building a financial model that accounts for income statement, balance sheet, and cash flow statement figures. The equity research analyst will typically build a valuation model, such as a discounted cash flow forecast and relative valuation model, to identify whether a company may be worth scooping up. As a result, equity analysts are well-versed in fundamental analysis, so they can spot nuances in company figures, like one-time charges, equity dilution from stock issuances, as well as make adjustments for currency swings and non-recurring items. Many of the top banking and financial institutions have their own equity research divisions. Many large and mid-size investment banks as well as boutique and regional investment banks have their own in-house equity research teams too. Mid-size firms include BNP Paribas, Brown Brothers Harriman, Cantor Fitzgerald, Evercore Partners, Guggenheim Partners, Houlihan Lokey Howard & Zukin, Lazard, Nomura, RBC Capital Markets, Rothschild, Stephens Inc, The Blackstone Group, and William Blair. Boutique and regional firms include Alderwood Capital, Aquilo Partners, Ascent Partners, Berkshire Capital, Boston Capital Partners, The Courtney Group, Dresner Partners, JMP Group, Maxim Group, Mazzone & Associates, and Susquehanna International Group. Equity research teams at these firms are usually structured with the lower ranking team members labeled Equity Research Associates and the more senior members earning the title Equity Research Analysts. To become an equity research associate, you usually need to join an institution after graduating from college or with an MBA. Or you may be hired from another division if you have notable expertise in a particular area. Equity research analysts also come from industry. For example, a medical student graduate who works on healthcare consulting projects at a top tier firm like McKinsey, Bain, or BCG may have so much domain expertise that research firms want to hire them. Once part of an equity research team, analysts will not only conduct due diligence on a specific group of companies but also on their competitors. As a result, the role is generally a good fit for analysts who have a voracious appetite for knowledge and an insatiable curiosity to learn more. If you’re thinking of a career in equity research, one of the best steps to take is to get an equity research internship, which is a low-risk way for both the firm to get to know you and a fast-track way for you to get experience. Whether you are buying equity research or producing it for clients, the structure of an equity research report is fairly standardized. To make investing decisions, portfolio managers want to know whether an opportunity exists to buy stocks on sale. Similarly, LBO and M&A bankers need to know whether companies are fairly valued. Quantitative analysis features heavily in making buy and sell decisions. Some of the important metrics for companies like Facebook, Amazon, and Alphabet include return on invested capital (ROIC), earnings per share estimates, and revenue growth. A good analyst often begins by building a revenue model, which is a spreadsheet featuring a list of variables that affect revenues. For example, Facebook revenues will depend on the number of users on its platform and how much time they spend engaging on the site. Google’s revenues will be affected by the number of ad clicks and the price per click among other factors. Netflix revenues will be influenced by the number of subscribers and the monthly price paid per subscriber. A good equity research report will concisely inform readers what the key metrics are and provide sufficient information to provide insight into significant forces affecting the company, whether internal, industry, or from competitors. Generally, equity research analysts spend countless hours scrutinizing data and gathering information from reading quarterly and annual reports. Frequently, they meet with a company’s top brass executives too. After the information gathering and number crunching phase, the equity research report is written, polished and made available to clients, who could be mutual funds, pension funds, investment management firms, accredited investors, or even high net worth investors. Equity research analysts who work on the buy-side publish equity research reports that are heavily focused on finding value stocks so they can spot winners. These analysts are experts in knowing how to research stocks and finding stocks on sale to buy. Many are also skilled in identifying overvalued stocks to short. Usually, these research reports are not made available to the public and include proprietary equity research. Some investment management firms commission buy-side equity research that will emphasize the results of financial models while others will pay equal attention to financial analysis as much as they will to issues like managerial control, sustainability criteria, governance issues and even ethical violations. Usually these buy-side research reports are supplemental to sell-side research reports that feature extensive due diligence, such as competitive analysis, supply chain analysis, customer research, and management interviews. Buy-side analysts can generally purchase sell-side research that includes financial models. For example, a financial model on a semiconductor chipmaker may include extensive quantitative data on microchip types, volumes, and prices. One common trait among both buy-side and sell-side analysts is they often have high communication quotients (CQ), so they possess a sufficiently high IQ to crunch the numbers and also have the ability to articulate and concisely share the results of their research. An equity research analyst salary can range significantly depending on the firm. Analysts at top tier investment funds who are also equity partners have been known to make millions of dollars per year. More typically, equity research analysts’ salaries are in the low six-figure range but could be as high as $250,000 annually when factoring in base salary plus bonus. An equity research associate salary will generally come close to six figures, especially if the analyst is more experienced or lives in an expensive city like New York or San Francisco, where higher salaries reflect higher living costs. Junior equity research analysts tend to make quite a bit less – approximately $50,000 on average – but can quickly boost their overall earnings when bonuses are factored in and they rise through the professional ranks. Top performing equity research analysts can spend an entire career covering a single industry if they wish. However, the allure of high earnings in the hedge fund industry or other buy-side firms can be enticing. Other opportunities include transitioning to a career in private equity or investment banking. If you like the idea of deal-making, investment banking may be a good fit. Equity research combines quantitative and qualitative research. Quantitative research usually involves building financial models like discounted cash flow forecasts to assess fair value while qualitative research may include speaking with company management, conducting customer research and performing competitive analysis. After conducting extensive research, analysts produce equity research reports that may be used internally by investment management firms to make buy and sell decisions, or sold to clients if published by an equity research firm. Generally, mutual funds, pension funds, accredited investors, and investment management firms purchase equity research reports. If you are considering a career as an analyst, you will generally need domain expertise in a specific sector or graduate with a finance or economics degree or an MBA. To succeed, you will need to be an avid reader, love learning, and be prepared to invest long hours researching companies. If that sounds like your cup of tea, the career offers a trajectory with big bucks to top performers! Have you worked as an equity research analyst? Do you work on the buy-side or sell-side? What tips can you share to help investors? >> How Do You Invest In Uber Stock? >> Which Vanguard Mutual Fund Is Best: VTSAX or VFIAX?